FLAT is as entertaining as it is honest and forthright about a subject that has been steeped in pink and sentimentality for far too long. FLAT is, quite simply, a darn good read. —Christiane Northrup, OB/GYN and the author of the New York Times bestsellers, Goddesses Never Age: The Secret Prescription for Radiance, Vitality, and Wellbeing; Women’s Bodies, Women’s Wisdom; and The Wisdom of Menopause. Filled with great openness and sincerity, FLAT adds an original and colorful layer to the pink-ribbon world of breast cancer. FLAT gives a voice to women who choose not to have reconstructive breast surgery after a mastectomy. At first thought it seems like such a radical idea, but after reading I’ve become so much more educated about the autonomy that women should have over their bodies, especially when dealing with a health crisis. 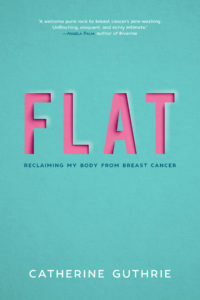 FLAT is a desperately needed narrative of one woman’s struggle living with breast cancer. It’s a memoir unlike anything on shelves now because the dominant narrative of breast cancer centers ‘feminine’ and heterosexual stories.